Chuckwalla iguanas are native to the deserts of the Southwestern US and Mexico. Iguanas are some of the largest lizards found in the Americas, with their whiplike tail making up about half of that length. Like other reptiles, iguanas are cold-blooded, egg-laying animals with an excellent ability to adapt to their environment. Iguana species vary greatly in size, color, behavior, and their endangered status in the wild. Some species, like the green iguana, are quite common; others, like Fiji’s banded iguanas, are endangered. Iguanas native to San Diego County are the desert iguana and the chuckwalla. Different iguana species look and act so differently, you might not recognize them as members of the same family. While some iguanas have colors that are vivid and bright, others have rather dull colors. Because iguanas can be found in a variety of habitats, each species has its own unique adaptations. The marine iguana of the Galápagos Islands is a skillful swimmer, and its black coloration helps it to warm its body after swimming in the cold ocean. 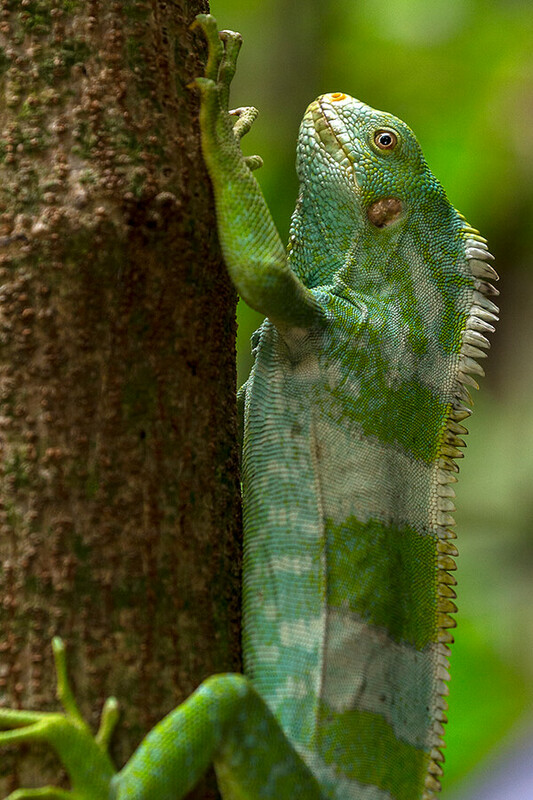 In contrast, the green iguana is at home high in the trees of a tropical rain forest, while still other iguana species have adaptations that allow them to live successfully in the dry, hot desert or rocky areas. With an emerald green body and bands of white or blue, more prominent on the males, Fiji’s three known iguana species inhabit a multitude of habitats, from coastal swamps and lowland forests to rain forests on Fiji’s volcanic slopes. Highly arboreal, they have long toes with sharp claws and long tails for balance in the treetops. Rarely seen on the ground, banded iguanas move from tree to tree by using the overlapping branches. They are omnivorous, feeding on leaves, flowers, fruits, and small insects. Adult banded iguanas may reach a length of 21 inches (53 centimeters)—more than half of which is the tail. When fully mature, they weigh between 3.5 and 7 ounces (99 to 199 grams), and males tend to be larger and heavier than females. The Caribbean islands are rich in reptiles, with more than 500 reptile species, 94 percent of which are found nowhere else on Earth. Several Carribbean iguana species are known collectively as rock iguanas, and some are found on just one or two islands. Female rock iguanas lay a clutch of 5 to 20 relatively large eggs each year; the larger eggs result in large hatchlings that evolved in response to the lack of native predators. Unlike their mainland counterparts, such as green iguanas, the island-dwelling iguanas do not need to produce a lot of offspring as a hedge against predators. The smallest of the rock iguana group are the Turks and Caicos iguanas. All eat a wide variety of fruits and serve as important seed dispersers for many native plants. Most iguanas are herbivores, eating fruits, flower buds, and young leaves. Some species also eat the occasional juicy mealworm or wax worm! The marine iguana dives in the ocean to scrape algae from rocks. At the San Diego Zoo and San Diego Zoo Safari Park, our iguanas are offered a fruit salad that includes dark leafy greens and a variety of fruits, while some species also receive crickets, mealworms, and wax worms. But because wax worms are high in fat, they are considered the “dessert” part of the menu! Three endangered Grand Cayman blue iguana hatchlings. No mama for the baby iguana: The females of most iguana species dig a burrow in a sunny area, lay their eggs inside, cover them, and then leave the eggs alone. Even arboreal iguana species leave the trees to lay their eggs. The temperature in the burrow stays a fairly constant 77 to 89 degrees Fahrenheit (25 to 32 degrees Celsius). The warm temperature incubates the eggs. All eggs in a nest usually hatch at the same time, and the young dig out of the burrow without help from the parents. On their own, iguana hatchlings face many dangers. The San Diego Zoo and San Diego Zoo Safari Park are home to many iguana species. As we care for them, we learn important things about them, such as ideal conditions for reproducing or special dietary needs. The information we learn can help us to strengthen the chances of iguana survival in the wild. We’ve had many breeding success stories over the years: the San Diego Zoo was the first zoo in the US to hatch the critically endangered Anegada Island iguana. The Zoo has a long history of working with Fiji Island banded iguanas, starting with a gift of six of these lizards from the prince of Tonga in 1965, and we welcomed our first hatchling in 1981. Today, the Zoo has the largest and most successful colony of this endangered species outside of Fiji. Most lizards require ultraviolet radiation to absorb calcium from their food, and banded iguanas seem to need more exposure than most. Our banded iguanas can bask all year, even in colder weather, thanks to UV-permeable skylights throughout our Reptile House. Most of them live in an off-exhibit area there, but a pair is always on exhibit in our Reptile House for guests to admire. 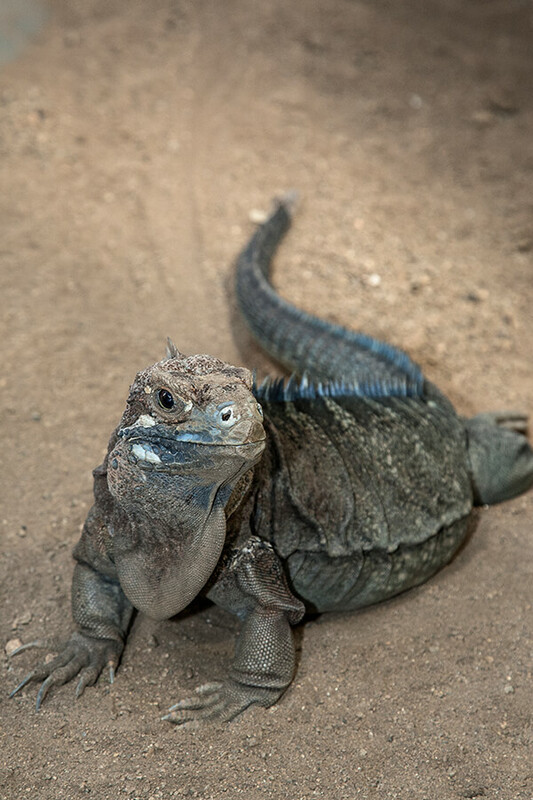 You can see two more iguana species at the San Diego Zoo; Exuma Island iguanas and a Cuban rock iguana live in large, outdoor enclosures between our Galápagos tortoise yard and the Reptile Walk. Each enclosure has a large “boulder” for the iguanas to sunbathe; the boulders are hollow and provide heat lamps, nest boxes, water, and privacy inside for the iguanas, if needed. When the outside temperature drops below 55 degrees Fahrenheit (12.7 degrees Celsius), a keeper placing a trail of tasty grapes coaxes the iguanas inside this rocky sanctuary! 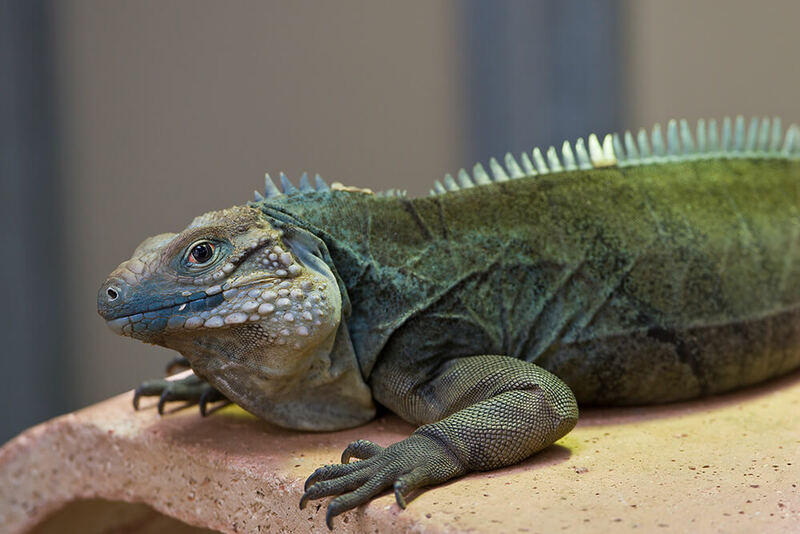 We are contributing to the recovery of Grand Cayman blue, Jamaican, and Anegada iguanas, known collectively as rock iguanas, by maintaining assurance colonies at our Kenneth and Anne Griffin Reptile Conservation Center, located on Safari Park grounds. The Center is the most advanced rock iguana breeding center in the world. As of August 2012, 20 Grand Cayman blue iguanas have hatched at our facilities, and we developed and maintain a studbook database for these rare iguanas. In the future, they will be shared with other facilities for further breeding to aid the continuation of the species. Habitat loss, the introduction of exotic animals that prey on iguanas, capture for the pet trade, and poaching are some of the threats to wild iguana populations. Some species that were once plentiful in the wild are now beginning to disappear. There are several measures that can help iguanas survive, such as captive propagation in zoos, hunting and collecting restrictions, and education programs for people living in or near iguana habitats. 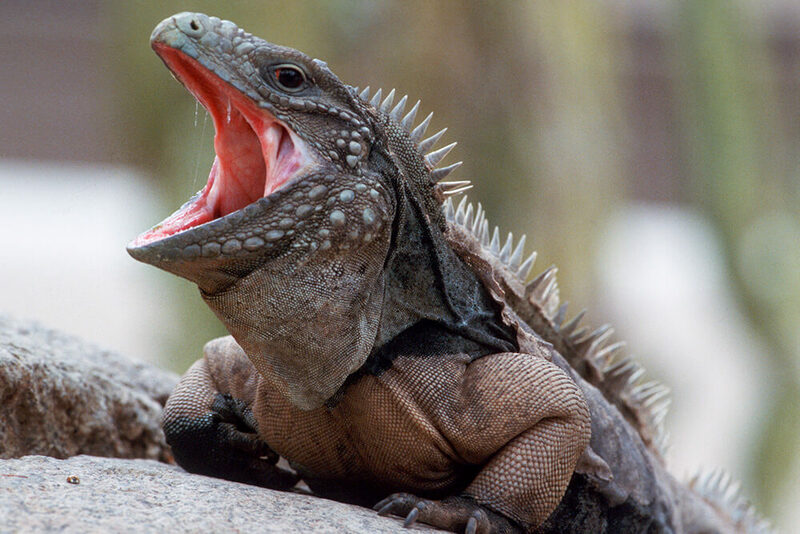 As a group, Caribbean rock iguanas Cyclura species are the most endangered lizards in the world. They suffered greatly when humans settled on these islands and began large-scale habitat destruction and alteration. Plantations, homes, and resorts cleared out the plants iguanas fed on, and car traffic became one of the biggest threats to iguanas on the move. Cats introduced to the islands by humans have been eating both iguana eggs and the young hatchlings, causing the iguanas' numbers to shrink. Working with local governments and other organizations, San Diego Zoo Global is helping these iguanas both here in our Kenneth and Anne Griffin Reptile Conservation Center, and in the field on various Caribbean islands. Our rock iguana breeding program has been so successful that a new facility was built in Puerto Rico to accommodate the growing population. Without this expanded facility, the fate of these beautiful iguanas would be less certain. The breeding program includes supporting the animals in our facilities and field programs to establish new populations and to move current populations to small islands with no people, so the iguanas have room to grow. We use a technique called “headstarting”: iguana eggs are incubated in a facility and the hatchlings are taken care of in large pens until they are large enough to protect themselves from predators, thus giving them a head start in the wild. We have translocated some species to smaller uninhabited and protected islands or cays where, it is hoped, the iguanas can flourish. To date, 179 Anegada iguanas Cyclura pinguis have been raised and released, nearly doubling the size of the wild population. Our goals include removing feral predators from Anegada Island and restoring iguanas to some of Puerto Rico’s satellite islands, where the species historically occurred. Since 2002, our recovery program for the Grand Cayman blue iguana Cyclura lewisi has boosted their numbers from a low of 25 in the wild to more than 500 released into a new wilderness reserve where they are now reproducing! 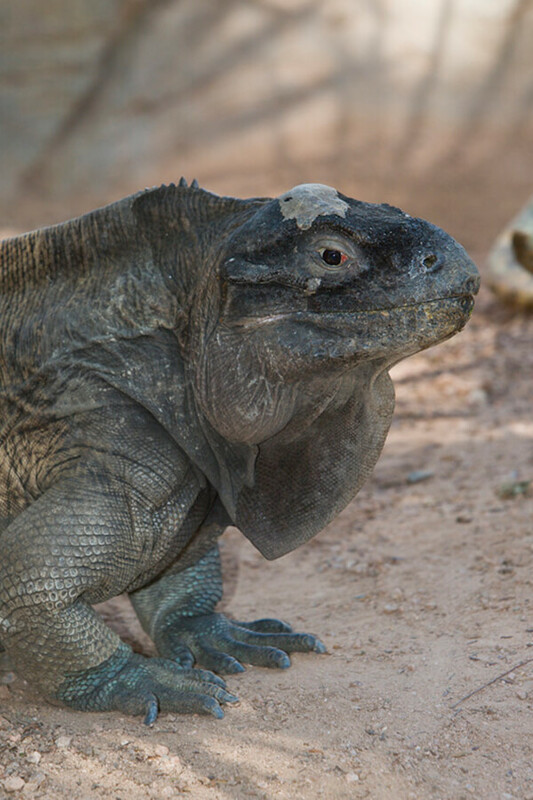 San Diego Zoo Global is one of several organizations in North America working to produce a captive, self-sustaining population of Jamaican iguanas Cyclura collei to ensure genetic diversity for the species' worldwide population. 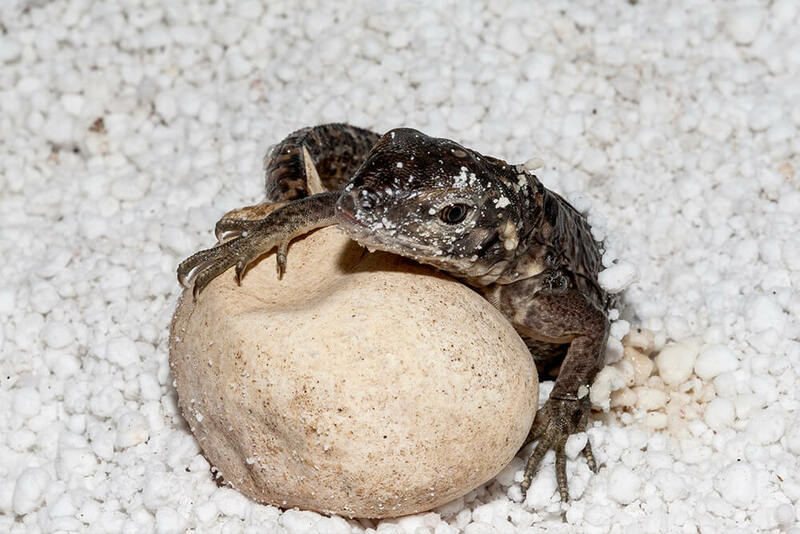 A male iguana hatched on August 30, 2013—the first time this species was successfully bred at our facility. In addition, we’ve helped implement conservation education programs on some of the Caribbean islands to increase public awareness and support for iguana conservation initiatives. The Lau banded iguana Brachylophus fasciatus, first described in 1800, was believed to be the sole iguana species in Fiji for nearly 200 years. In 1979, the Fiji crested iguana Brachylophus vitiensis was found on one of Fiji’s volcanic islands, and that island was soon set aside as a crested iguana sanctuary, which helped increase the species population dramatically. A third species of Fiji iguana was described in 2006, the Fiji banded iguana Brachylophus bulabula. San Diego Zoo Global’s Genetics Division has been working to further test blood and skin samples from iguanas living on 23 of Fiji’s islands, and the results suggest at least another new species is in need of description! These genetic studies will help determine how iguanas should be protected in Fiji and which managed-care lineages could be used for reintroduction. The government of Fiji has loaned 50 of these iguanas to use as part of a species survival program. Both banded and crested iguanas are endangered, due to habitat destruction for housing and the clearing of land for farming and livestock, as well as the introduction of mongooses and feral cats, which prey upon the iguanas and their young. Mongooses were brought to Fiji to hunt rats in the sugarcane fields, but they spread to wild areas and also feasted on the iguanas. Fiji is also battling the introduction in 2000 of the green or common iguana Iguana Iguana, called the American iguana in Fiji. That species has become quite a pest and is said to be a threat to local vegetation; eradication measures are underway. Visiting the San Diego Zoo and the San Diego Zoo Safari Park helps the giant rock iguanas of the West Indies, which are the most endangered group of lizards in the world. Our rock iguana breeding program has been so successful that a new facility was built to accommodate the growing population. Without this expanded facility, the fate of these beautiful iguanas would be less certain. The breeding program includes supporting the animals in our facilities and supporting a field program to establish new populations and to move current populations to small islands with no people so the iguanas have room to grow. Marine iguanas of the Galápagos Islands (off the coast of Ecuador) are excellent swimmers. In the Animal Kingdom, males often have the brightest colors, but not among green iguanas; males are often a bright orange, females are green, and the juveniles are a brilliant green. The banded iguana male’s bands can change color—from green to blue, gray, or black, according to his mood. Banded and marine iguanas can secrete excess salt through their nostrils.